Today I am sharing the post you hope you never need. If you follow me on Instagram you know that my father, Alan Barrie Best, passed away a few weeks ago. He was 87 years old and had lived a good life but no matter how old someone is, it is always difficult to say goodbye. 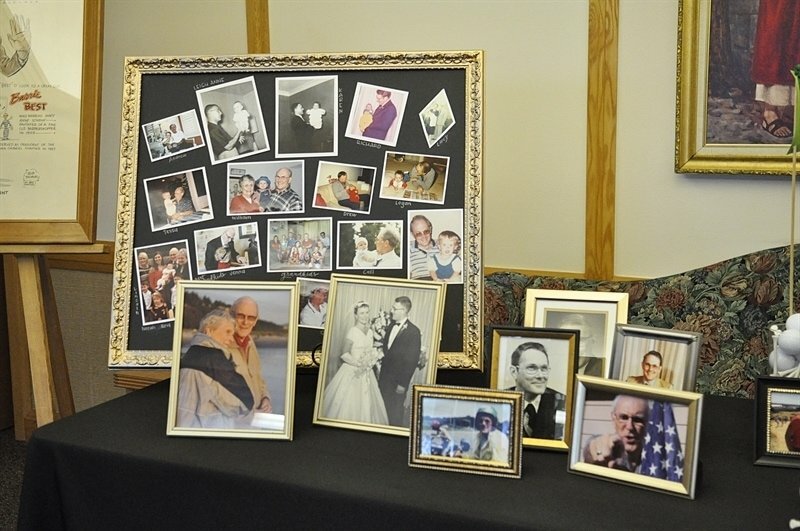 Today I’d like to share the things we did to celebrate my dad and how to plan a funeral or memorial service. My father’s memorial service was held four days after he passed away. We didn’t have a lot of time to pull things together but with the help of family and friends we were able to do it. 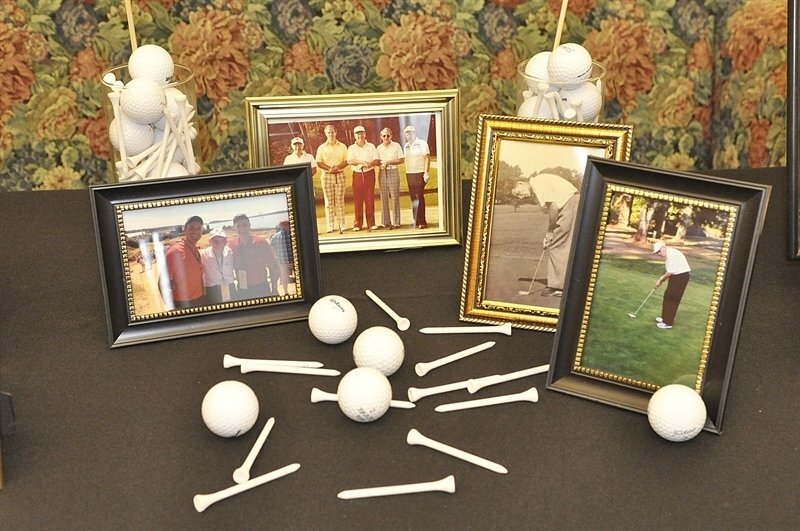 As we planned my father’s memorial service we wanted it to reflect the amazing life he had lived and the things he loved most in life – his faith, his family, golf, music and ice cream. I think my father was pleased with what we did. 2. 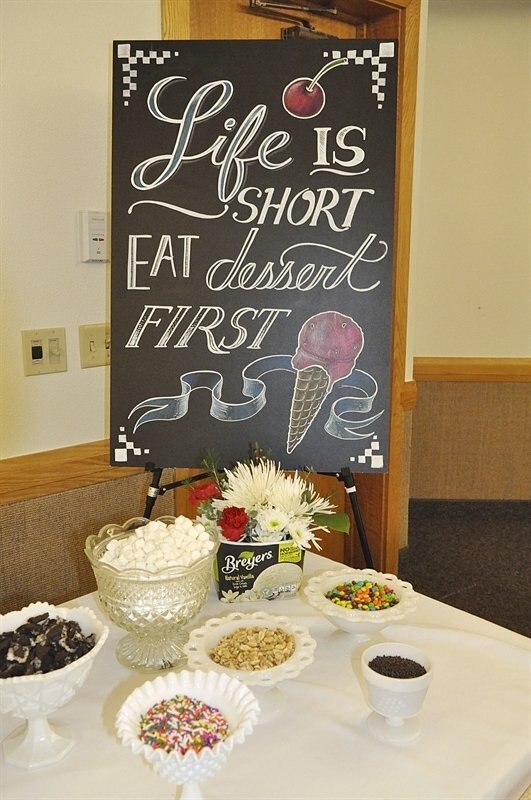 After the Service Gathering – Instead of a family dinner after the service as is typical in most Mormon funerals we decided to hold an ice cream social. My father loved ice cream and enjoyed a large bowl before bed for most of his life. In fact, growing up we had a freezer just for ice cream in the garage. My dad always said, “There’s always room for ice cream, it melts and fills in the cracks.” So it was only appropriate that we all enjoyed a hot fudge sundae in honor of my dad. We set up tables and chairs in one of the rooms in the church where everyone who attended the service could gather. We had ice cream, hot fudge sauce and all the toppings. So many of my sweet friends volunteered to help me, from making the hot fudge, serving, making signs, etc. I have been blessed with good friends. 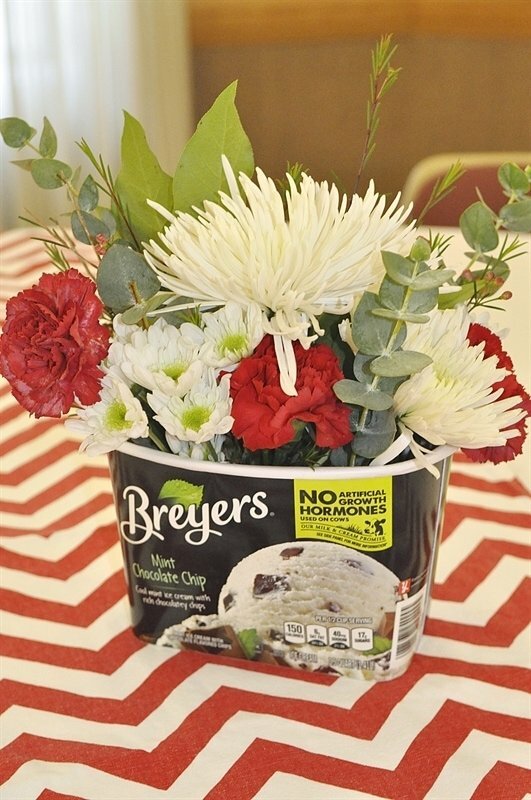 I carried out the ice cream theme by filling empty ice cream containers with flowers for the tables. The night before the funeral I hosted a family dinner at our home and we enjoyed ice cream pie for dessert so I had enough empty containers. I don’t think I will ever eat ice cream again without thinking of my dad. My dear friend Bill made this great chalkboard sign for me. It is exactly how my dad felt about life! Some sweet friends of my sister in law made brownies. The addition of the little golf flag was perfect. The ice cream social after was a wonderful opportunity to visit with friends who were there and enjoy being together sharing memories of my dad. 3. The Photo Displays – I spent several days going through old photos of my father from his childhood through current photos. I wanted to put together a display that reflected all of the things that were important to my father. 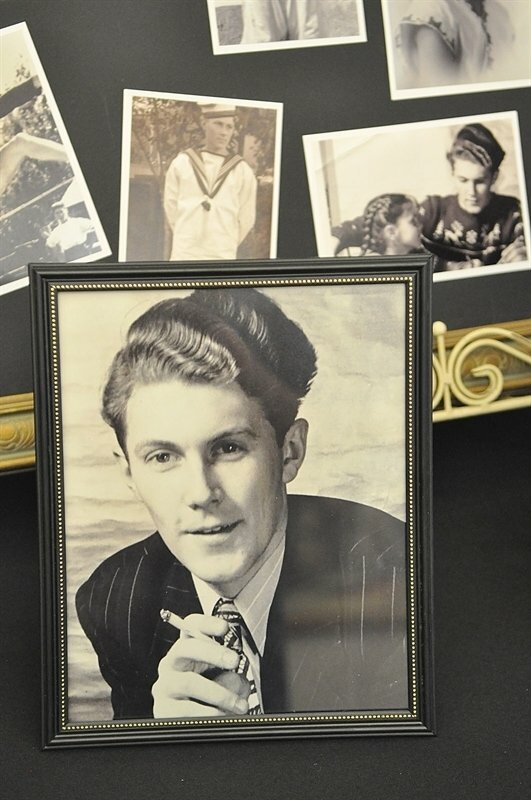 The first section was photos of his childhood and youth. This is one of my favorite photos of my father – look at that hair! Music was a huge part of my father’s life since he was a young boy so we devoted a whole section to it. 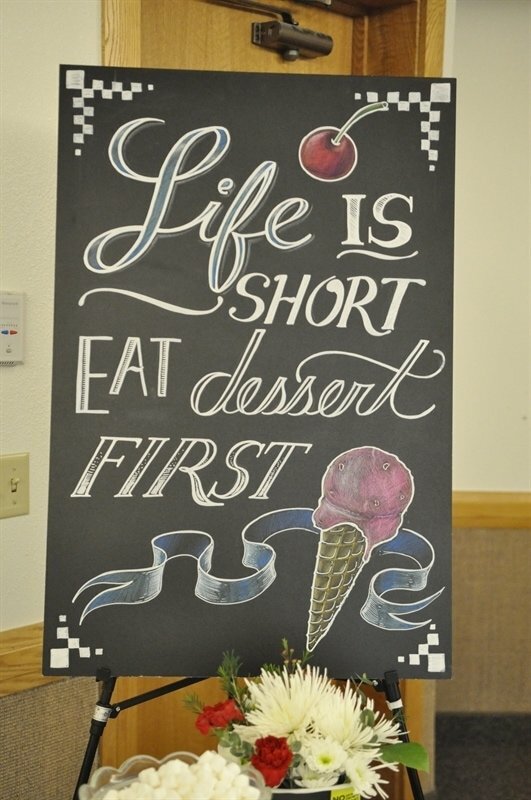 I found a great quote which I thought was perfect for display that my sister hand lettered. 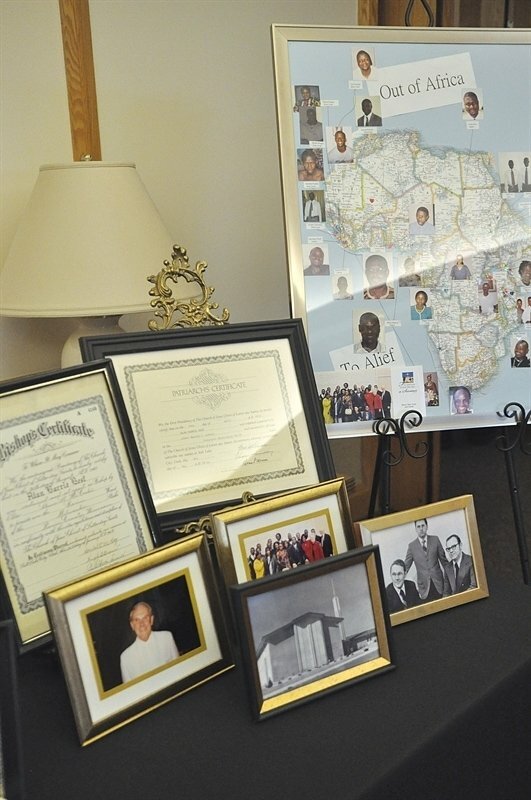 My father’s faith and church service was a huge part of his life so we showed photos from the time he served as a Mormon Bishop, Stake Patriarch, temple worker and full time missionary. And finally, his family. I found photos of my father which each of his children as a baby and then each of his grandchildren and great grandchildren. Of course there was a photo of his precious and much loved bride, my mom. 4. 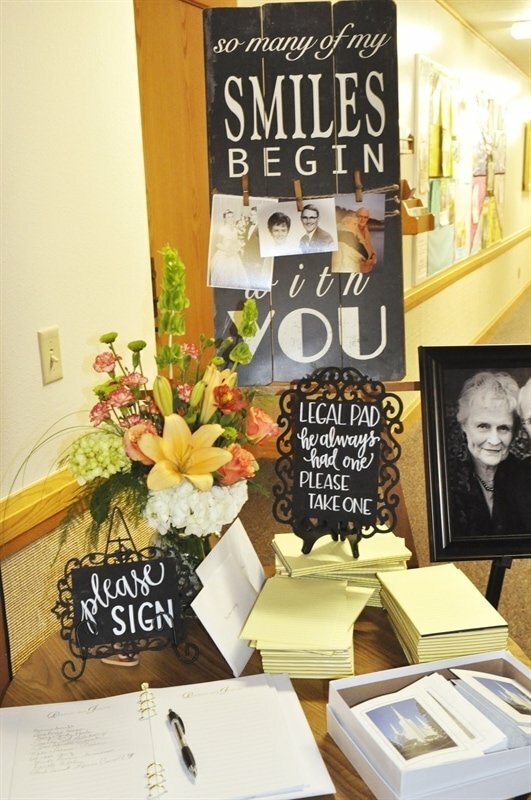 Sign in Table – As people entered the chapel we had a book for them to sign their name with a photo of the Portland Oregon LDS Temple on the front, one of my father’s favorite places to be. 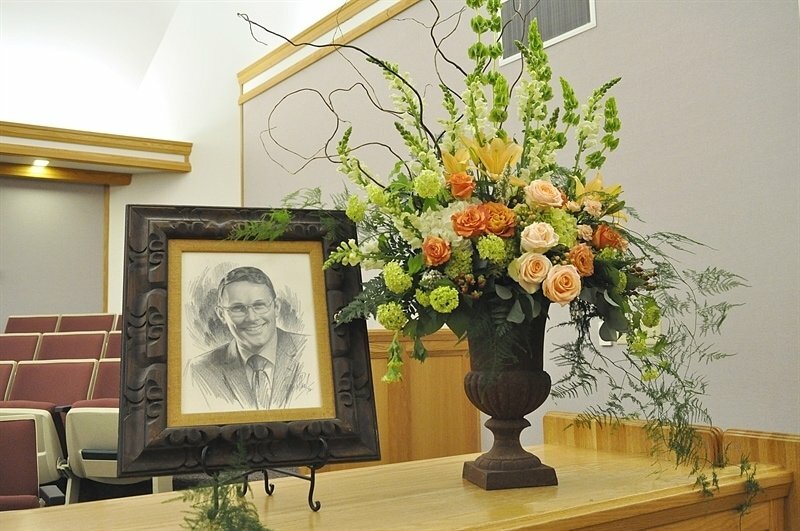 He served as a temple worker in the Portland Temple for 25 years and only stopped working weekly in the temple a few weeks before his death. We also had a pile of small legal pads for people to take. My father loved legal pads and always had a dozen or so laying around. My father was a meticulous note taker and documented his life in great detail on a daily basis. We asked everyone to take a legal pad to remember my father by. For all the large photo displays I used frames I already had and spray painted them gold. I then painted some pressed board we had in the garage with chalkboard paint and had my husband cut it to fit the frame. I bought all the smaller frames at the Dollar Store along with the legal pads. 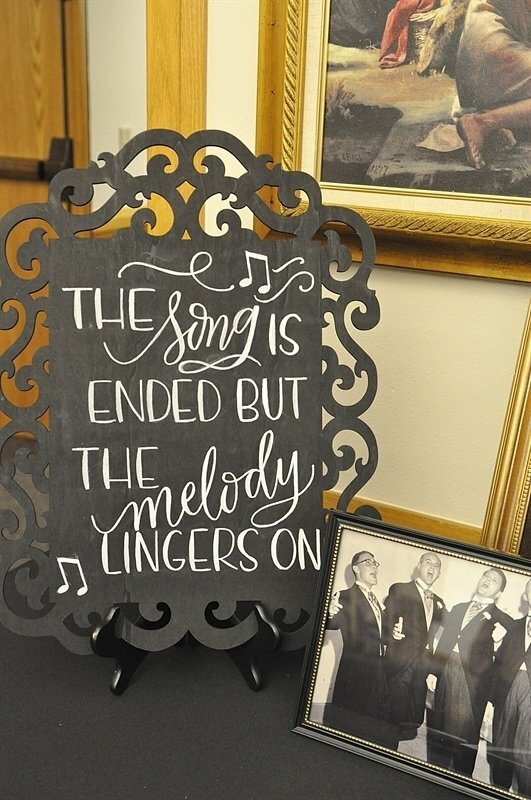 The decorative chalkboards are from Michaels, I painted them with chalkboard paint and my sister hand lettered them. 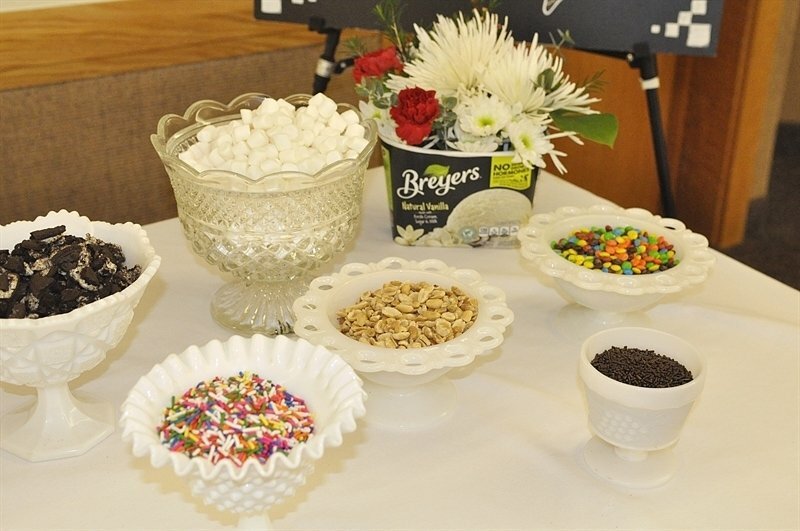 I was able to channel my energy and grief into putting together the photo display for the service and planning an ice cream social for everyone after the service. I hope my father was happy with our efforts, I think he was. After the service and ice cream social we gathered at my brothers house where we enjoyed the food that people had been so graciously and generously dropping off at our houses the last few weeks. A few nights after my father passed away a dear friend and her husband showed up at my door with an entire roasted turkey and huge loaf (we are talking HUGE) of homemade bread. It was the perfect thing. 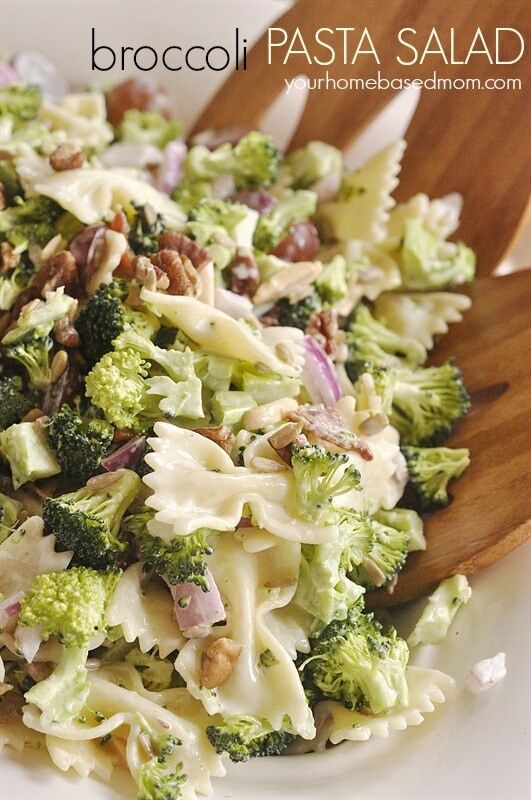 With family in from out of town and no time to cook or grocery shop it was a real blessing. 5. Lantern Memorial – the night before the memorial service we all gathered at my house for a family dinner. 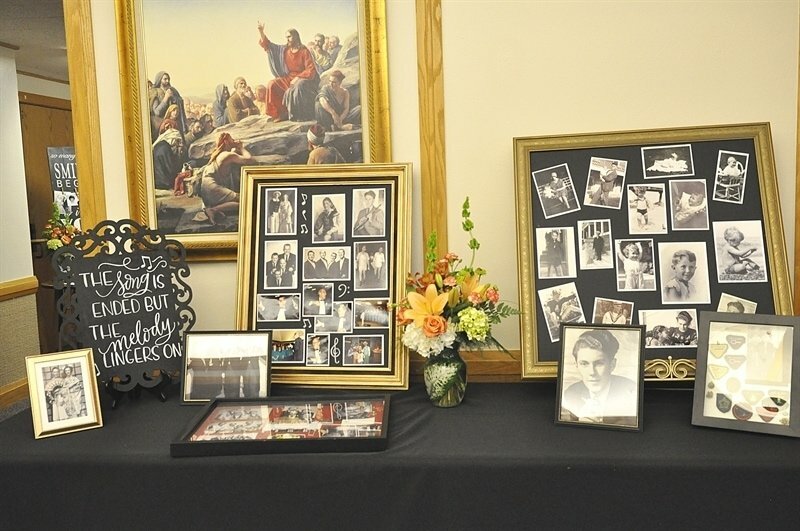 We finished up last minute details on the displays and things and all the grandchildren sat in the dining room with grandmother reminiscing about all their favorite memories of grandpa. My son, Clark, shared many of those memories at the memorial service. 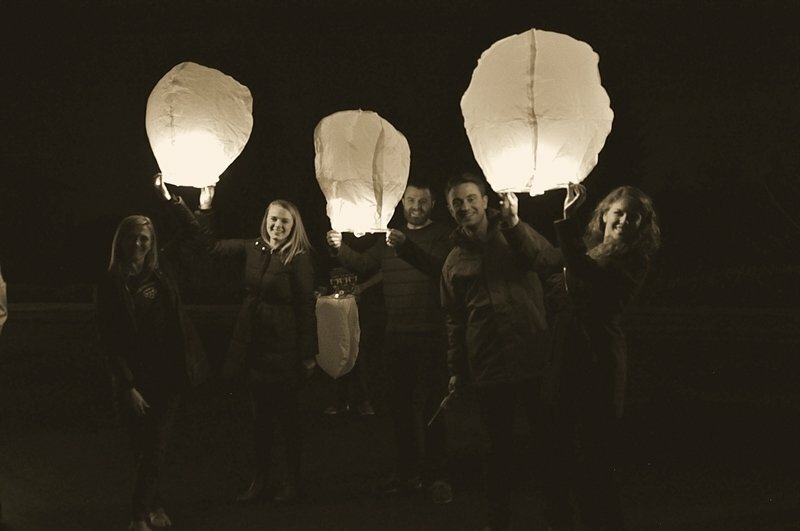 After dinner we went out into our cul de sac and launched the lanterns in memory of grandpa. 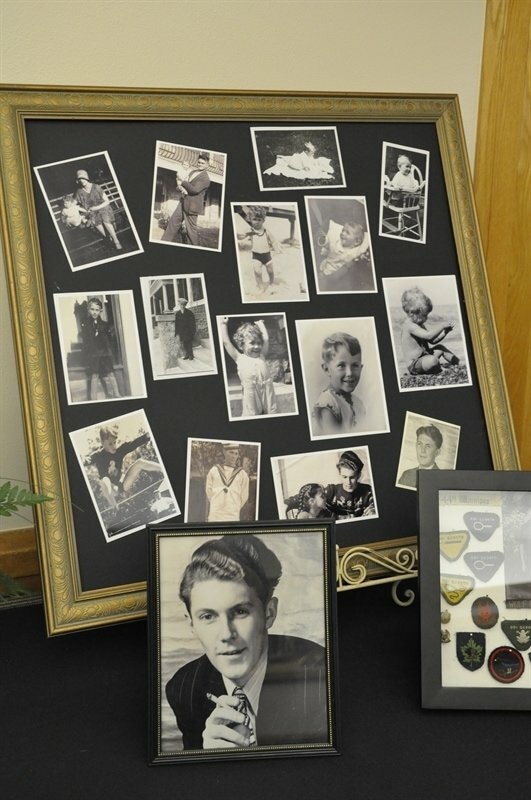 All of his grandchildren were there except for two spouses and there was one of his five great grandchildren there too! 6. Family Photo – because our family is scattered and not together very often, my mother wanted to have a family photo taken. I love this photo of grandma with her grandchildren minus two. 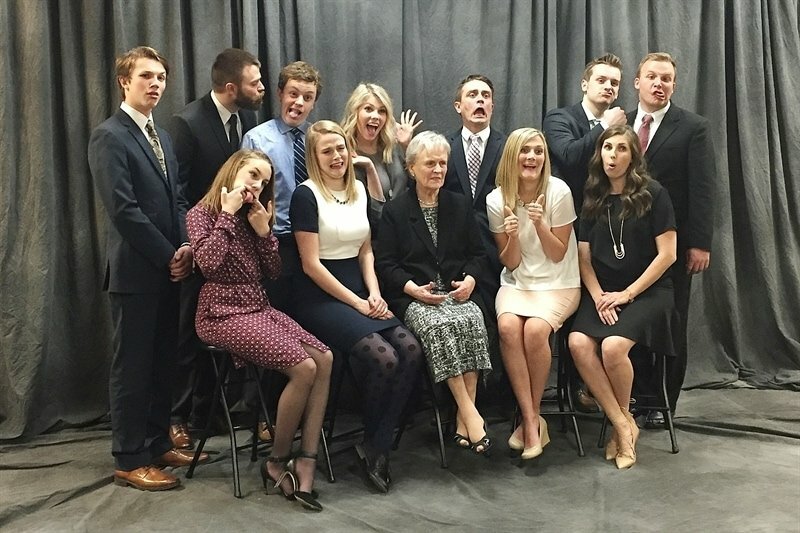 Grandma wasn’t quite sure what to do when the photographer told everyone to make a silly face. 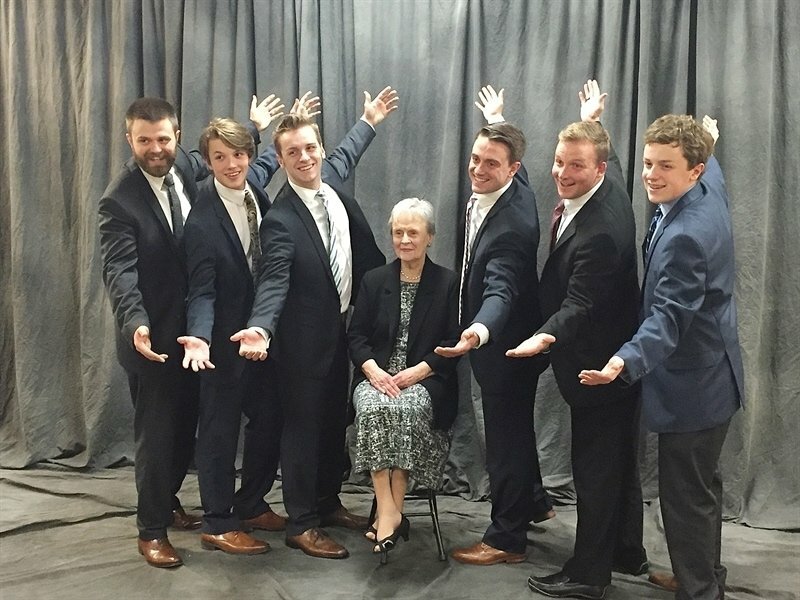 I love this photo of grandma with all her grandsons with their best Barbershop Quartet pose! When I spoke at the funeral I expressed my gratitude that I had the “Barrie Best” father my whole life! What an amazing and beautiful way to honor your dad! I am very sorry for loss. It’s never easy to say goodbye. Thank you Kristen. I hope we did him justice with what we put together. Leigh Anne, thank you for sharing such a sensitive subject and my condolences to you and your family. Your father sounds like a very special man and prayers to you and your family during this time of grieving. Such great ideas and I will keep this handy as when going through a loss it is hard to collect the thoughts of what to do. 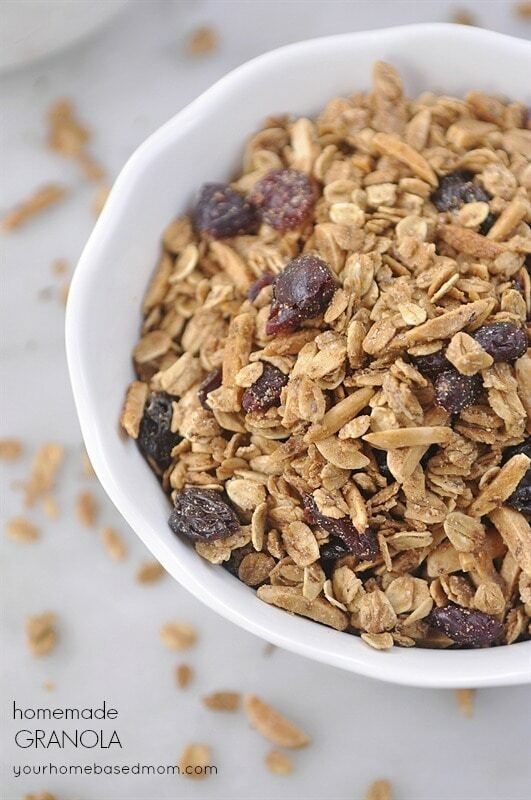 Dianne, Welcome to the blog! The last thing my father said to me was Hello Sweetheart. He always called me sweetheart. A friend gave me some money to buy a plant in remembrance of my dad and I will be buying a Sweetheart Rose bush. What a nice send off, I had tears. He would have been very pleased, I’m sure. Thank you – I believe he was pleased. Becky, How nice that your sister was able to sing and such a wonderful song. I held it together pretty good during the service until I heard my dad singing on the recording. I am so sorry for your loss. Thank you for sharing this difficult time with us. Thanks Laurie! 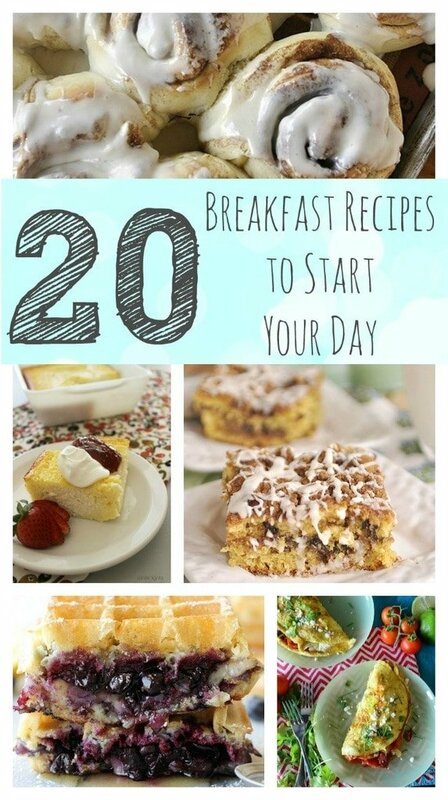 I hope by sharing it will help others. Oh Leigh Anne what a beautiful service that must have been. I too am keeping this as my own mom, although in good health, is 93. I hope that me and my sister can put somethig as lovely and meaningfull as what you did. I love the choice of songs! My mom has even said what song she wants (I know that my redeemer lives) and what she wants on her headstone (till we meet at Jesus’ feet). 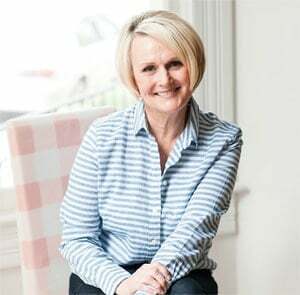 I was very touched by the Leigh Anne and my prayers are with you and your family. Thankful for the gospel that assures us we will indeed be together again!! Thank you so much Donna. We really wanted music to be a big part of the service as it was such a big part of my father’s life. It was such a blessing to be able to have my dad there with us through the recordings of his singing. Grateful that familes are eternal! 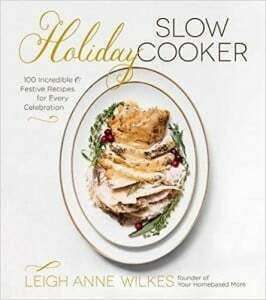 Dear Leigh Ann, I am so utterly grateful to have been allowed a glimpse into your wonderful celebration of life. I, too, am LDS and hold these things dear. 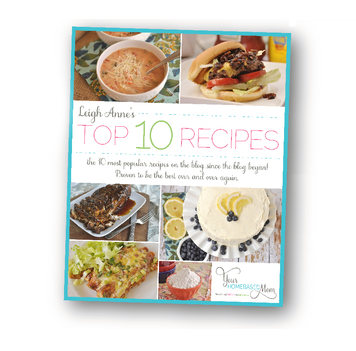 I can deal with very strong emotions, such as grief, by doing these types of things…..decorating, planning, food. All the little details are what bring me such joy and I hope you won’t mind if I try to use some of your thoughts and ideas when it’s time for my mom to join dad. Bless your dear, sweet heart. Deb, It was a great help to me to be able to channel my grief and emotion into planning this celebration of my dad. It made the process so much easier and it is what I love to do. Please use whatever you need! Thank you so much for sharing this. Although it is a hard thing to do, we all seem to have to go through with this sometime in our lives. I’m quite sure he is pleased with your “party” and service. What a wonderful tribute! Nancy, I hope he was pleased and I loved celebrating him with a party and ice cream. Ice cream will always remind me of my dad. Thanks Leigh Anne. Very touching (yes I shed a tear or maybe more). So many compliments and most saying it was the most touching and beautiful service they had every attended. Thanks to three great children. Leigh Anne, I’m so sorry to hear of your Fathers passing. 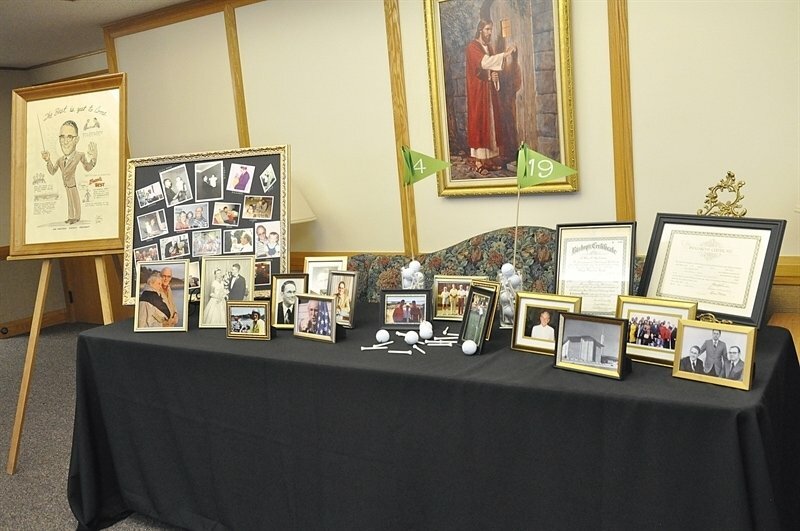 You did him a great service with all the mementos and heart felt displays, etc. at his funeral. I’m sure he was there in spirit and appreciated it all along with everyone who was there. He sounded like a wonderful and kind man. How blessed you were to have him for a Dad. One day your reunion with certainly be a special one. Love and hugs, Valerie H.
Thank you so much Valerie. Hopefully we did him justice! I hope he had a front row seat watching up in heaven. Thank you so much for sharing your Father’s service with us. 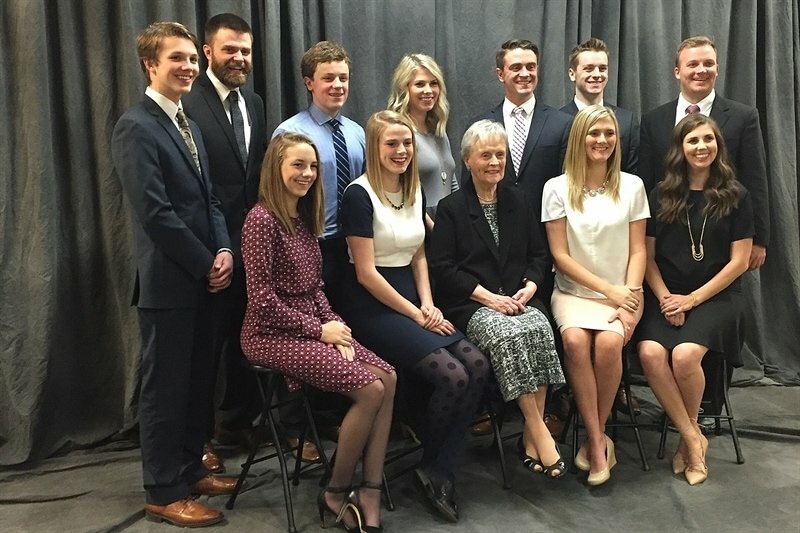 I have had the pleasure of serving with your parents in the Portland Temple. Have learned so much by their example and their love of the temple. When I received information of your Fathers passing I was in St George, UT and couldn’t make the funeral. Thank you for the beautiful pictures and thoughts. Thanks for sharing your wonderful parents with us and who have made such an impact in our lives. Thank you Edie! My father loved is 25 years of serving in the Portland Temple and he loved the people he worked with there too. Going through photos is such a therapeutic way to have a few smiles mixed in with the tears. You honored all of the most important parts of your fathers life. Isn’t it lovely that ice cream will always make you think if your dad? That sentiment will last forever. Just today, it was the anniversary of the death of a friends mother. She said her mother loved Burgerville milkshakes and fries and every year her family goes to dinner at Burgerville in her honor and have milkshakes and fries. I think a yearly ice cream social is a great way to celebrate your dad. 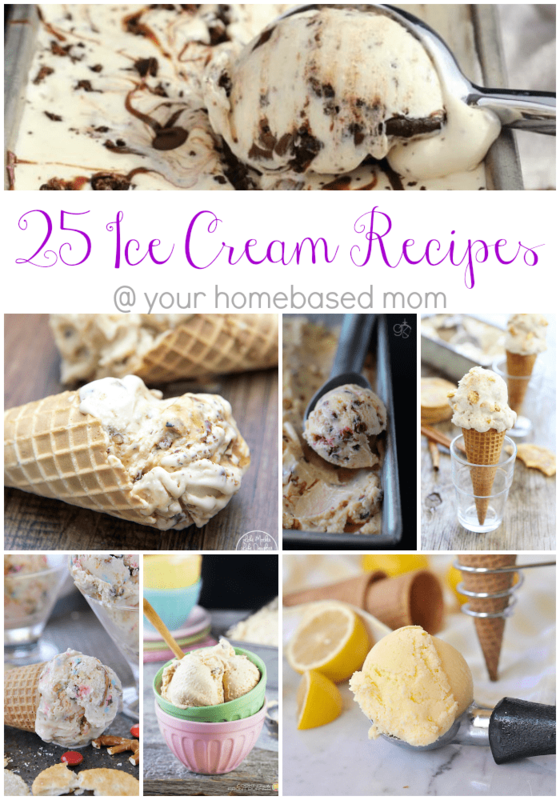 Dawn, I love the idea of once a year having an ice cream social to celebrate my date!! Dear Leigh Anne, So sorry to hear of your father’s passing. He certainly lived a very wonderful life. It was so uplifting to read about him. My sympathy, also to your Mother. Thank you Louise, I know you know too well what she will be going through. Your sweet daughter Jane has been so kind to me during this time and I know she learned her amazing ability to serve from her mother! 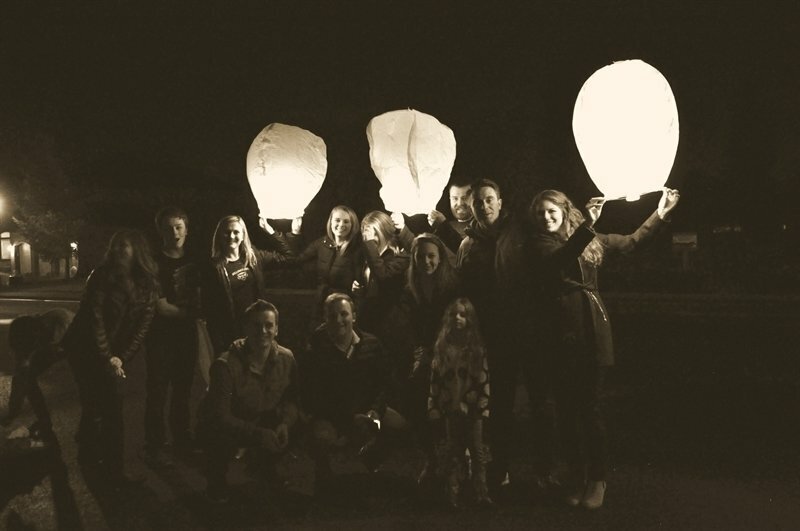 Leigh Anne, what a beautiful tribute to your amazing father. I am so sad to hear of his passing and wish you and your family all the best. What a wonderful idea to have an ice-cream social and the pictue of you mom with the grand-children was lovely. A beautiful tribute to your dad. So sorry for your loss. This was awesome! Great celebration of life! I lost my son Easter Sunday. He was in a motorcycle crash in Thailand, and we are still waiting for his body to be returned to the US. I am numb and had to force myself to Google ‘how to plan a funeral’. Your ideas are perfect!! We are LDS too and Jason always kept a journal. So, I think we will pass out small journals where you gave legal pads. I am so sorry for your loss. What a difficult time you are going through and if my post can be of any help to you and make things easier I am so grateful. I love the idea of giving out small journals. Prayers and hugs to you. 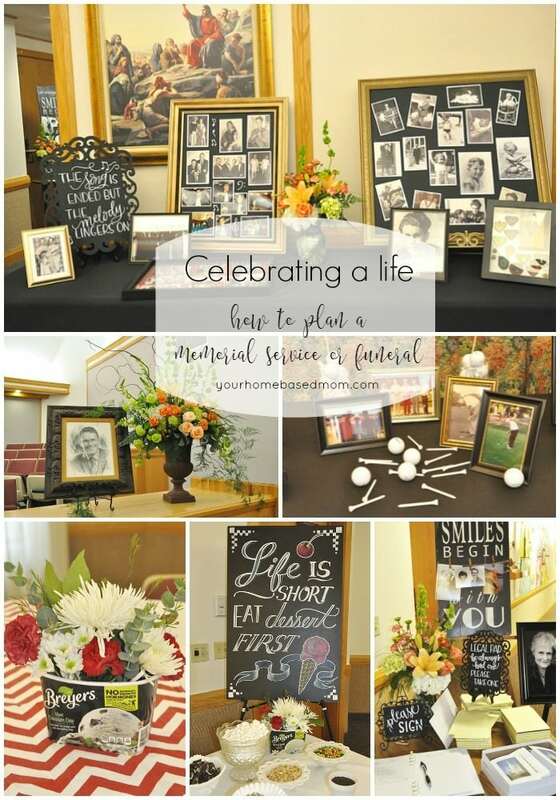 Indeed, when planning a funeral, try to picture all the good times. It can help you from being as sad. Also, try to take objects that represent those moments, and put them on a table or something at the service. My father died four days ago and I am helping plan his memorial service….I want it to be something special, as my pops was an amazing father to 9 children…thank you for posting this. I am so grief stricken I don’t know where to begin-but your post has given me a direction to follow. It really looks beautiful….I hope I can do just as good of a job for my father. Christine, I hope the post can be helpful to you. Love and hugs to you as you work through this process. I am sure your father will be pleased with what you do. Connie, I am so sorry for your loss. I am glad that the post is helpful to you at this difficult time. 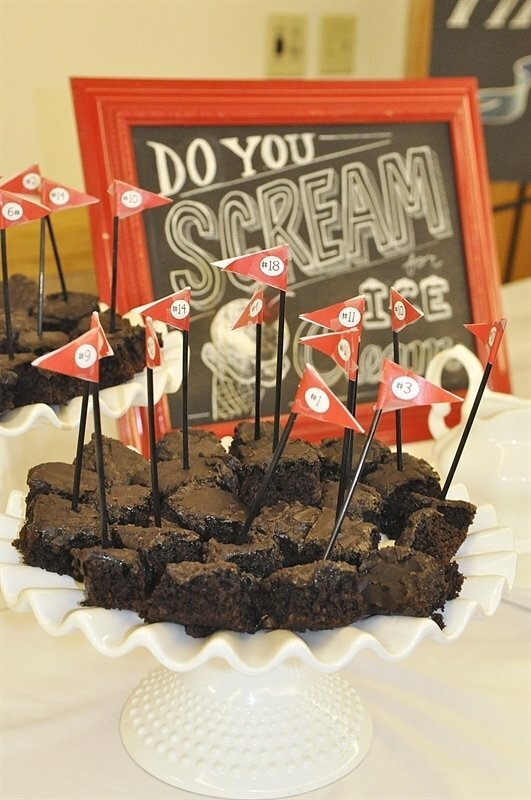 Is there skmeplace I could buy the dessert sign? I love it and it would be perfect for my moms celebration of life. No, a friend of mine made it for me. Sorry.